One of Bangkok’s oldest shopping malls, Siam Discovery has undergone a transformation. Each floor, or ‘lab’, has a unique theme and design, featuring a thoughtful selection of brands and products. On the ground level, you’ll find the women’s department and also the largest Comme des Garçons flagship store in Thailand. Aside from the usual designer labels such as Yohji Yamamoto and Opening Ceremony, highlights are Japanese labels and streetwear brands the likes of Facetasm, Beautiful People and Dressedundressed. The men’s floor is the star of the mall. There’s a gentlemen’s barber, plus the Pur-suit section where you’ll find formal and semi-formal wear with brands like Mister Painkiller, as well as Jirawat handmade leather goods, premium pomade and a bar. The Street Lab, located on the first level, is where you’ll find streetwear, sports brands and Japanese selvedge denim. Rama I Rd, Pathum Wan, Bangkok. +66 2658 1000. www.siamdiscovery.co.th. Daily 10am-10pm. Fans of vintage kitsch will be awed by the Rod Fai Train Market, an open-air market for clothing, furniture, toys and collectibles from Thailand, China, Burma, the US and beyond. Srinakarin Soi 51, Bangkok.+66 08 1827 5885. Bangkok’s many colourful Floating Markets are justifiably famous – small paddling boats loaded with fresh produce, food vendors and more cram into waterways and canals. The most famous is Damnoen Saduak – 100km south of the city and accessible via various tour operators. Damnoen Saduak 70130, Thailand. 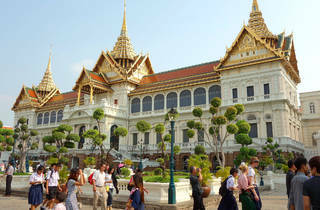 The Grand Palace is a Bangkok icon, built in 1782. 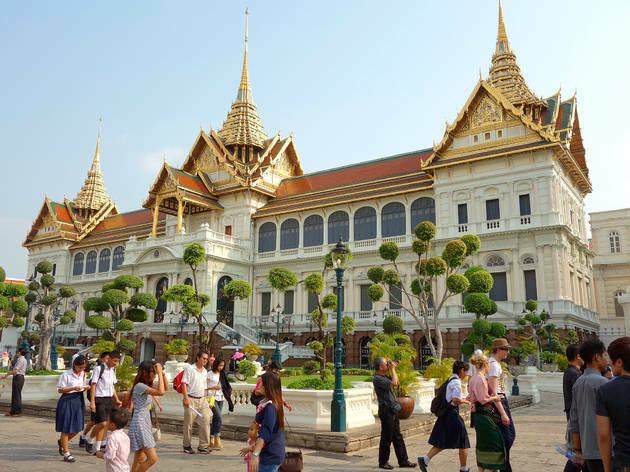 A network of buildings, halls and lawns built in a combination of Thai and European styles, it no longer houses the royal family but instead hosts official events and is open to visitors. The complex houses the Temple of the Emerald Buddha. Na Phra Lan Rd, Phra Nakhon, Bangkok. Masaharu Morimoto is famous as TV’s Iron Chef Japanese and he recently opened Morimoto in Bangkok. His modern Japanese fare touched with Asian and Western flavours includes rock shrimp tempura that’s served with two types of different sauces: a spicy Kochujan sauce or a rich wasabi aioli, and a tuna pizza that features sliced, raw tuna served on a crispy taco shell with anchovies, olives and Thai chili. 96 MahaNakhon CUBE, Narathiwas Ratchanakarin Rd, Bangkok. Daily 6-11pm. The local outpost of Hong Kong’s smash hit Bao Burger Joint, Little Bao, serves the famous chewy white steamed buns recreated into burgers featuring four different fillings. Try pork belly and chicken: the nine-hour slow-cooked pork belly is well-seasoned and tender, while the marinated spicy chicken is tongue-numbing. 72 Courtyard Soi Suthumvit 55, Bangkok. Daily 6pm-midnight. Evil Man Blues is run by Liam Baer, the head mixologist and man behind the Honey Badger: a cocktail inspired using rosemary-washed Bourbon with a hint of lemon, ginger, honey and Yellow Chartreuse. 72 Courtyard, Thonglor, Sukhumvit 55, Bangkok. Tue-Sun 6pm-2am. Laneway joint Q&A Bar serves innovative cocktails in a setting reminiscent of a vintage train carriage. The cocktails list rotates on a monthly basis. Have a go at the Pinkish, which gives a twist to the usual Negroni mix by using homemade rhubarb and grapefruit gin as the base spirit. 235/13 Sukhumvit Soi 21, Bangkok. Mon-Sat 7pm-2am. Enter a secret code into the fake telephone booth (call them to ask for it on +66 087 066 7711) to get into Havana Social. The interior is inspired pre-revolution Cuba in the ′40s, with vintage furniture, a worn-out ceiling and clothes hanging from the ceiling. Drinks are Cuban-inspired as well with signature drink the Caribbean Smashed Mojito, plus a great Hemingway Daiquiri. Sukhumvit Soi 11, Bangkok. Daily 6pm-2am. Housed in a 47-storey skyscraper in an ideal part of town for bars and restaurants, St Regis Bangkok is one of the top hotels in the city. Rooms feature floor-to-ceiling windows and chic, Thai-influenced design. There’s free Wi-Fi throughout the hotel, butler service, concierge, and an outdoor pool overlooking the city and the Royal Bangkok Sports Club. 159 Rajadamri Rd, Bangkok. +66 2207 7777. www.stregisbangkok.com. Qantas (www.qantas.com) flies daily to Bangkok with leading Australian produce, wines, beers and spirits in both business and economy on the A330 aircraft, alongside hundreds of hours entertainment, world-class service and new flatbed seats at the pointy end.